Jennifer Downing, Chef/Instructor, giving presentation, “Pantry Basics in a Cooperative Kitchen” at the Kickapoo Country Fair. The 9th Kickapoo Country Fair took place at the Organic Valley Headquarters, One Organic Way, La Farge Wisconsin on Saturday, July 28, 2012. 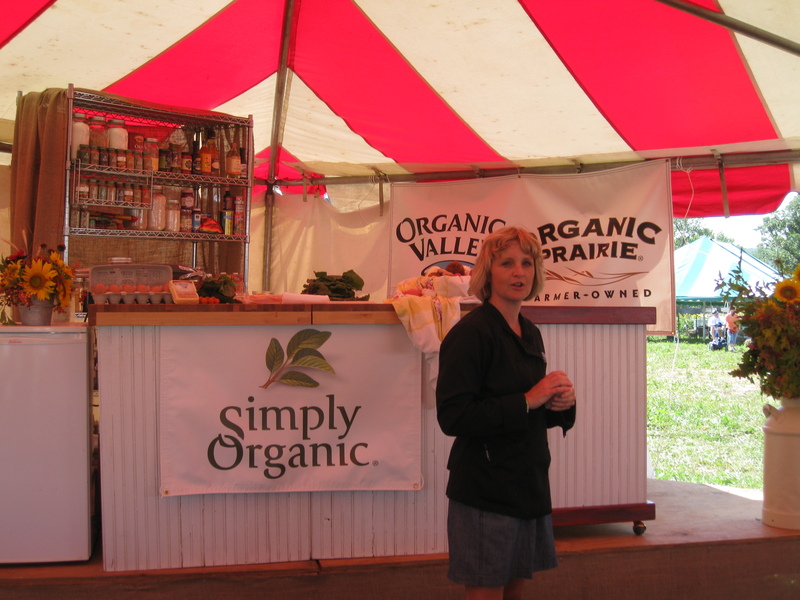 The Kickapoo Country Fair in the Midwest’s largest food and sustainability festival. One has the opportunity to explore the flavor and family fun through dynamic speakers, live music, kid’s activities, and hands-on workshops. For more information visit www.kickapoocountryfair.org. Amil’s Inn Bed and Breakfast had the honor and privilege of hosting one of the culinary workshop presenters-Jennifer Downing of Nourish. Her presentation, ‘Pantry Basics in a Cooperative Kitchen’ provided ideas, tips and recipes for keeping a well-stocked cooperative pantry: the refrigerator, freezer, dry goods and other essentials. Check out www.nourishcooking.com/recipes for the recipes used during her presentation—Backyard Swiss Chard and Bacon Frittata and Quinoa, Garbanzo and Spinach Salad with Smoked Paprika Dressing. With a love for everything edible, the kitchen is the place Jennifer is most at home. Her business, Nourish, affords her the opportunity to share her enthusiasm for teaching through small cooking classes, large presentations and hosting trips focusing on fresh foods. Some of her specialty workshops include home cheese making, preserving and sausage making. Jennifer’s vast food knowledge and involvement with local food policy organizations informs her delicious instruction. She fills her classes with useful techniques, tips and strategies that help her students nourish their lives and feed those they love. Jennifer lives in the western suburbs of Chicago with her husband, four kids, tow dogs, seven backyard hens and a hive of honeybees. In her spare time, you may find her in the garden, reading and writing about her many passions. To learn more about Jennifer’s presentations, see www.nourishcooking.com or her personal blog, In the Yellow House.